So, the other day on Facebook, I asked my readers which stamp set/bundle they wanted me to use next, and asked them to vote for either the Dragonfly Dreams, or the So in Love bundle. I used the So in Love stamp set and So Detailed Thinlits Dies, but I also used other products, from the Falling in Love Suite (I think the So in Love Bundle is unofficially part of the suite). I started by die cutting the largest floral die cut in the So Detailed Thinlits Dies from Sweet Sugarplum cardstock, which I then glued onto a panel of the Falling in Love Designer Series Paper. I swear – there isn’t a pattern in this entire selection that I don’t love! For this card, I used the sweet little falling hearts; because they’re 2 toned, it almost looks like there’s a vellum layer over top, but there isn’t! After attaching the die cut to the DSP (I used the Multipurpose Liquid Glue, just dotting it randomly across the back of the die cut. I like that it dries clear, and I can use my Adhesive Eraser if any smudges over onto the DSP), I attached a length of the Very Vanilla 1/4″ Satin Ribbon along the left side. I attached it around the back of the DSP using pieces of the Tear & Tape to hold it in place. I then made a bow of the same ribbon, and before attaching it to the panel, I tied on one of the Falling in Love Embellishments with a bit of the Gold Metallic Thread. I then attached the DSP panel to the Blushing Bride cardstock front. The sentiment is from the So in Love stamp set; I stamped it in Sweet Sugarplum ink; onto Very Vanilla cardstock, and used the So Detailed Thinlits Dies to die cut it, then my Paper Snips to cut out just the middle part. 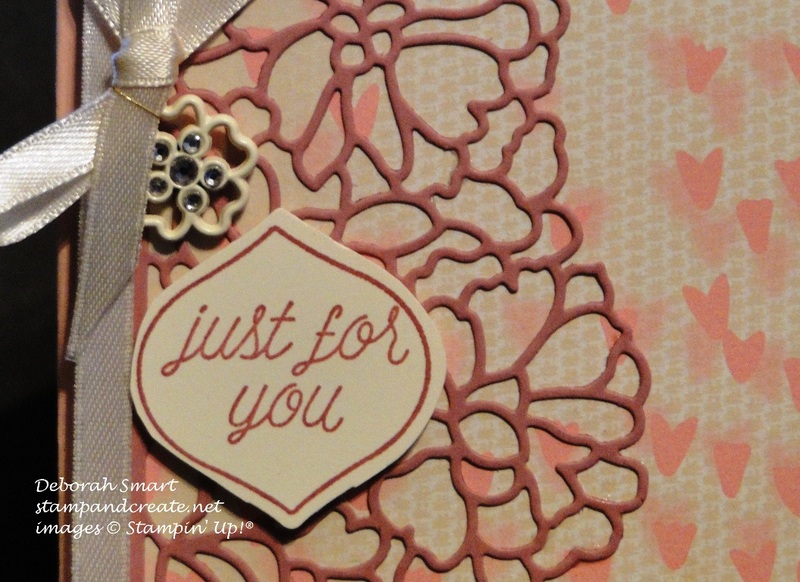 It was attached to the card front with Stampin’ Dimensionals. 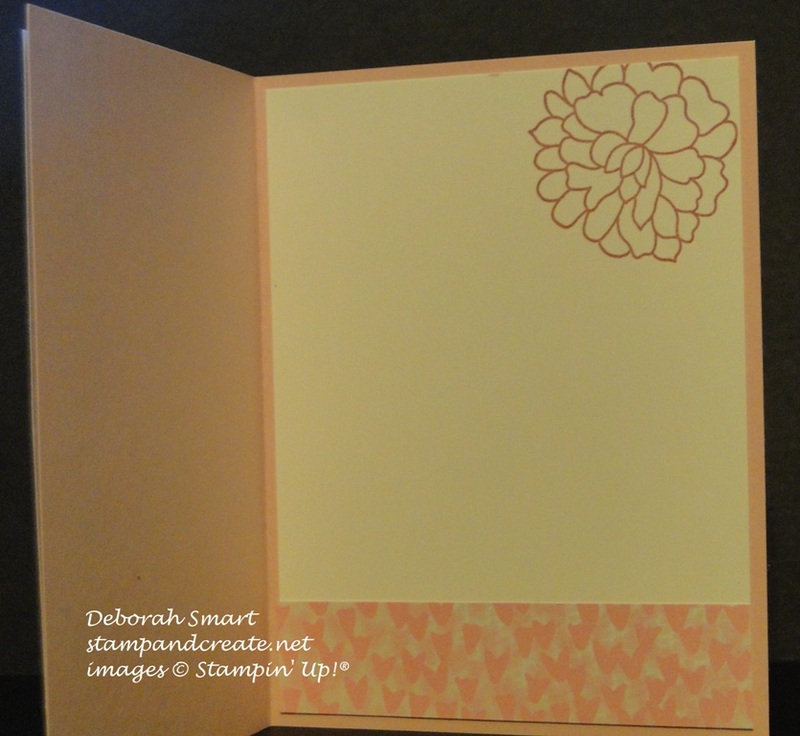 I added a piece of Very Vanilla cardstock to the inside, and stamped the large floral image in the upper right corner. I haven’t added a sentiment yet; I’m going to wait until I decide who to give the card to, and depending on the occasion. I think this would be a lovely handmade card to give to someone for a wedding, anniversary or even birthday. I also added a strip of the same patterned DSP to the bottom of the inside panel. The wonderful thing is that you can purchase both the So in Love stamp set along with the So Detailed Thinlits Dies, in clear mount or wood mount – and save 10% off the combined price! There are a lot of great bundles in this Occasions catalogue – well worth the investment, while saving money, and time creating! If you’d like to order any of the products I’ve used to make this card, you can click on any of the images below, and be taken directly to my online store, or you can contact me directly, and I’m happy to place your order for you. Don’t forget – I’m also offering my Product Shares, so you can get a portion of all of the lovely Designer Series Papers and Embellishments, without buying full quantities! See THIS POST for all the details on how to order. Thanks for having a look at my project today! Tonight I’m looking forward to my team meeting; the members of my team will be coming over, we’ll be doing some stamping, playing with the new Stampin’ Up! products, and doing some business talk. I’ll be back tomorrow with some more sharing – but in the meantime, I’d love it if you would leave a comment, and let me know which stamp set/bundle YOU would like to see featured!